Click on any photo to obtain a larger version. The concept is simple. 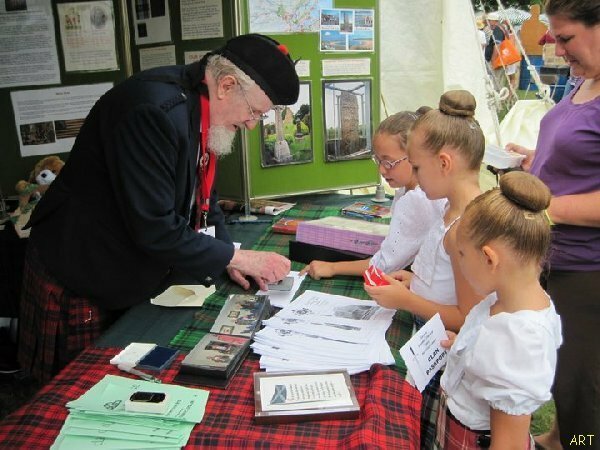 At no cost to the children or the Clans, provide a booklet for the youngsters to go on a "treasure hunt" along the Avenue of the Clans to collect stamps of the badges and learn a wee bit about their Scottish heritage at the same time. How do we measure the success of the plan? 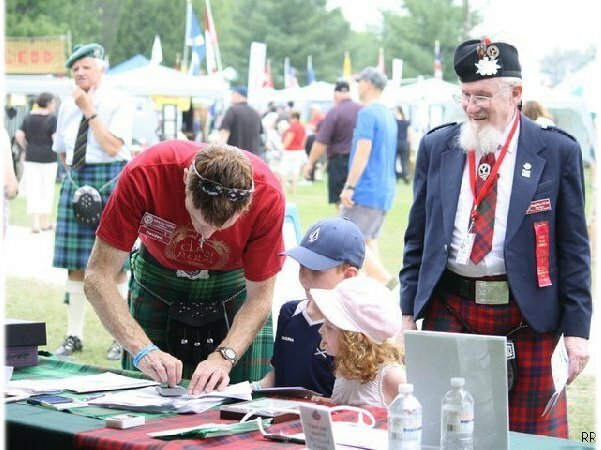 Hopefully, there would be some local feedback from the people of Fergus, their Fergus newspaper, or the Administration of the Fergus Scottish Festival itself. Sadly, we have very little to report from these sources. If there was any success to report, perhaps it may be attributed to fair weather and a very good support team. Perhaps you are one of those persons from the support group who is registering and/or confirming your active support by reading this section today. There are too many of you to list individually, but THANK YOU anyway. - We'd bet that the Elliot Clan Society . . . Canadian Region . . . will have a stamp next year. The estimated costs of 100 booklets in colour was $89.50 + tax (or approximately $102.92), compared to b/w at $45.50 + tax (or approximately $52.33). We figured that 500 booklets with 80lb cover stock and 12 blank sides per booklet would be ample as a preliminary test of the idea. The actual cost on July 7 came to a total of (downpayment $100 plus balance $157.08) $257.08 in spite of the HST of 13% and an increase in paper costs. About 495 were distributed on Saturday, August 14, of which 200 went to the McKiddies Centre (split between morning and afternoon). A dozen each went to seventeen clans which responded positively about having rubber stamps of badges; this accounted for 204 more booklets. 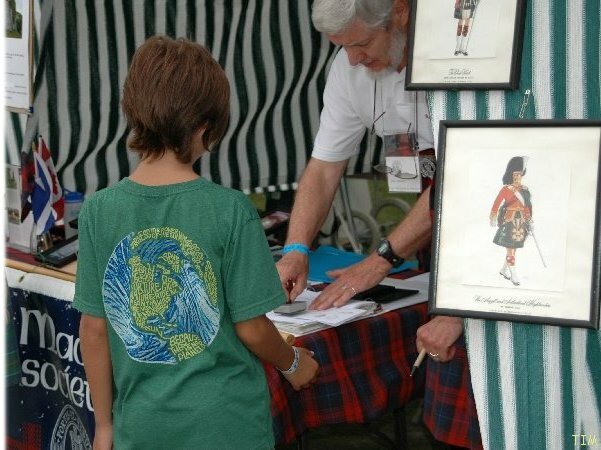 Clan Wallace ran out of booklets and got another dozen. 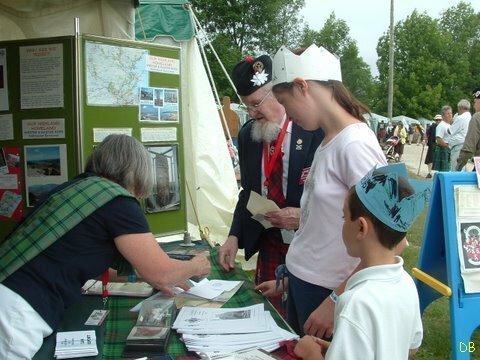 The balance were handed out by my wife (Patricia Ross) and I at locations where youngsters were lined up, such as at ice-cream vendors, or along the Avenue of the Clans after Highland Dancers had completed their competitions; other children with parents arrived at the Clan Ross tent without Clan Passports, and received one on-the-spot. None of the 495 booklets were left at the end of Saturday. With very few exceptions, the booklets were handed to the youngsters in the presence of their parents. 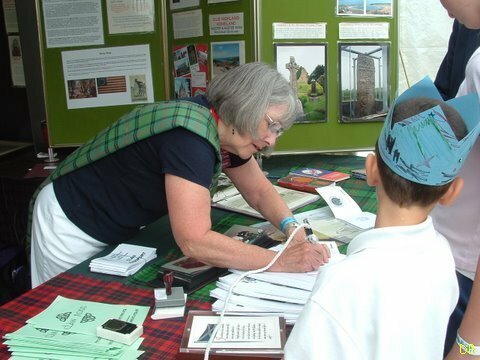 One young lad came to the Clan Ross tent for our stamp but, when I checked his booklet, he had already received our stamp; he said that he was trying to fill the booklet. Another lad showed up on Sunday, and said that he didn’t get stamps from the Ross, Hunter, Gunn, MacNeil and Campbell tents on Saturday . . . so I got the stamp from the car to satisfy part of his request. 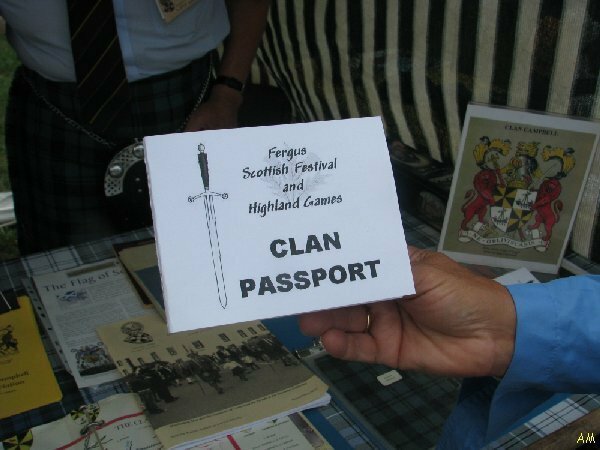 A couple of adults asked for a Clan Passport booklet; one said she was a “wannabee” from Ohio, who wanted to know more about the clan system. What Were the Side Benefits? Janette Veal of Stratford. 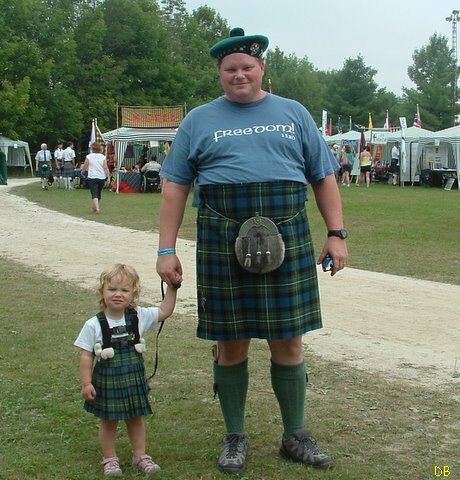 Ontario, whose son contributed photos for the Clan Ross website wrote, “We (the family) thought your passport idea was brilliant. 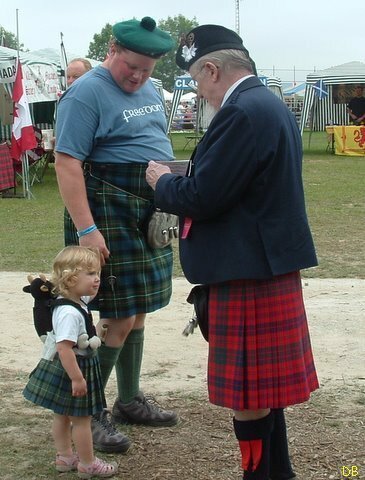 It certainly gets the young folk involved with the concept of clans, and, of course, the adults must go along with them (a double-edged sword?). The kids don't stop until they have entered every last clan in the book ! I have to say that the whole children's programme was excellent which is a must if you are to keep the families returning each year. There were new activities as well as some old favourites and all age ranges seem to have been covered - well done ! My wife noted that the demand for booklets was beyond expectations. We ran out and needed more on Saturday afternoon. 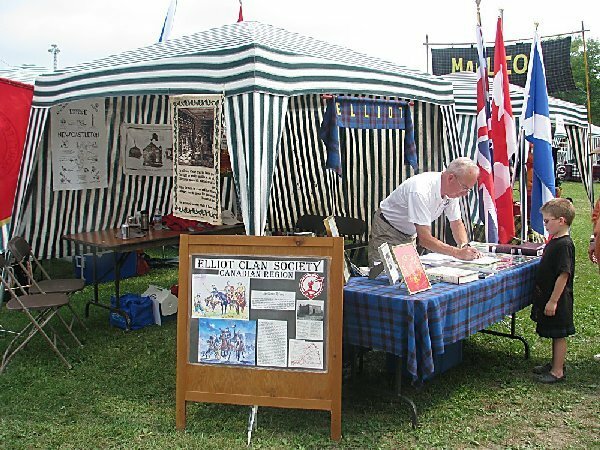 Perhaps 700 Clan Passports could have been ordered. I would say that weather played a major role in the success of the booklets. 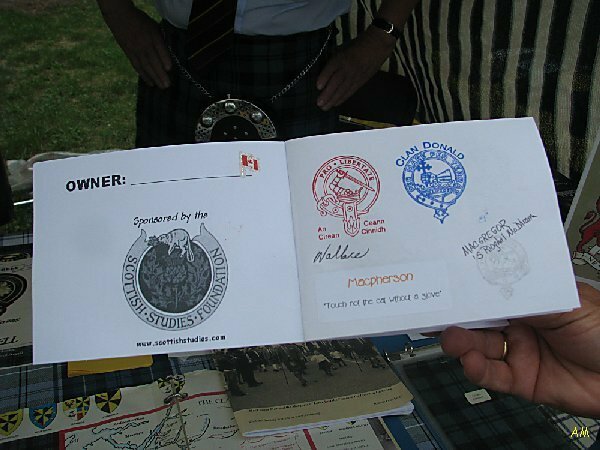 Any promise to provide Clan Passports should be qualified by a statement that we reserve the right to cancel the handouts if there is bad weather such as happened at the Fergus Scottish Festival and Highland Games in August of 2008. A handy parking spot is key to the security of the booklets as well. Any Clan Passports which are retained can be used the following year. There was a very important measure of the success of the programme. None of the booklets were tossed on the ground. 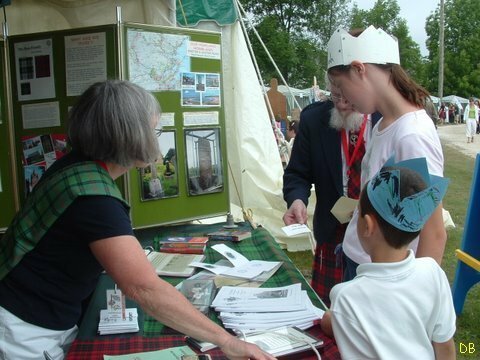 The youngsters kept the Clan Passports.